The temporomandibular joint is the complex, hinge-like joint that connects the lower jaw to the skull, enabling it to move up and down and from side to side. When the joint becomes inflamed, the ease of opening and closing your mouth is gone. Everyday movements such as chewing and yawning are suddenly painful and challenging. But there is no reason to suffer. TMJ disorder treatment is available from your Lake Elmo dentist, Dr. Katie Daniels. Call today to find out more! Is Stress the Main Cause? Stress is usually a contributor to TMJ disorders. Unfortunately, many times when we are stressed, we take that stress out on our TMJ by clenching or grinding our teeth. Other reasons for TMJ disorders include malocclusion (a poorly matched bite when your upper and lower teeth do not meet properly) and teeth grinding (bruxism). Your pain could also be because of an injury to the jaw, genetics, or the environment. Sometimes the exact cause is difficult to determine. 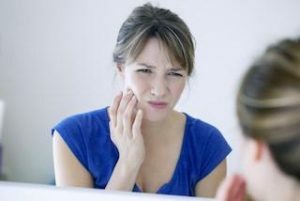 Women tend to suffer from TMJ disorders more often than men, but the reason why is not yet clear. When managing TMJ pain, Dr. Daniels begins by evaluating your triggers and educating you on how to modify habits so you can reduce inflammation in the joint. Self-care and lifestyle changes may include “resting” the jaw by reducing some of the movement. You might be advised to avoid chewing gum or to eat only soft foods. Exercises such as massaging the muscles around the TMJ might also be recommended. Applying ice or moist heat can also help relieve symptoms. If simple lifestyle modifications do not help, a night guard can be made to help alleviate symptoms and get you back on track and living life. Occasionally, when TMJ dysfunction is severe, Dr. Daniels might give you a referral to a physical therapist or a dentist who focuses on TMJ disorders. You don’t have to live with chronic pain from TMJ disorders. Give us a call for a consultation today so we can get to the bottom of the cause of your pain! Dr. Daniels looks forward to seeing you and helping you find relief!